My very favorite author, E.L. Konigsburg died on April 21, 2013 at the age of 83. I clearly remember in 1972, my 4th grade teacher reading aloud From The Mixed-Up Files of Mrs. Basil E. Frankweiler to our class. Then, on my own, I checked out from the public library ALL of her books. By 1972, there was a shelf-full. She is the first author that I read and read and read everything she wrote. She is the first author I called “my favorite”. She then kept writing and in 1997, she won the Newbery again for writing A View From Saturday. And as a teacher, I will ALWAYS introduce my students to her books. We are lucky…though she is gone from this earth, her books, her stories, remain! 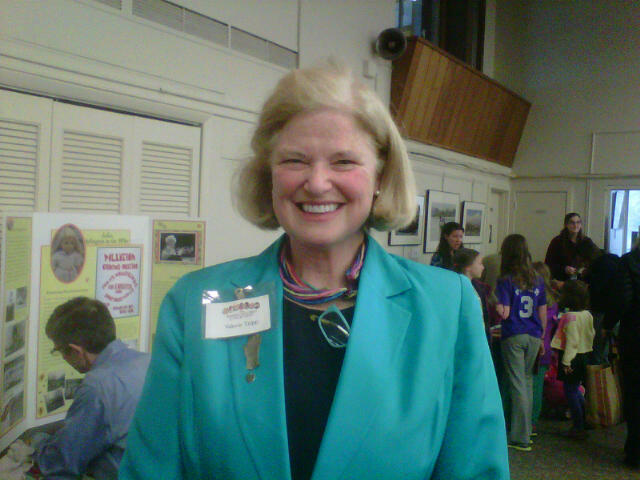 Author, Valerie Tripp, historical fiction writer of American Girl books! I enjoyed an hour at Cherrydale Library in Arlington, VA listening to the historical fiction author of many of the American Girl books, Valeria Tripp. Thanks to her, we have the memorable characters of Felicity (9 yrs old in 1774), Josephine (pronounced hos-e-fin-a and 9 yrs old in the now New Mexico area in 1824), Samantha (9 yrs old at the turn of the 19th century), Kit (9 yrs old during the Great Depression), and Molly (9 yrs old in 1944, during WWII). Personally, I always liked Molly most because my own mother was also 9 yrs old in 1944!!!! Now another favorite is Julie who is 9 yrs old in 1972 (I was 9 in 1972!!!). Thanks to Nana, my girls own Samantha (Bridgit) and Joesphina (Anne). About 15 years ago, we read-aloud all 6 books in each series….Felicity, Molly, Addy, Josephina, Samantha, Kit and Molly. On my own, two summers ago, I discovered the new Julie series. Valerie today said she was working on a NEW SERIES to be published in 2015 but she would NOT share a name or a time period. But I will remember to be looking for it in two short years! Ms. Valerie Tripp shared that to write these books, she first thought about girls in the present time and what they spend their time doing. For example, the girls in the audience today spent the day at school. Then she thought about what girls were doing to learn in Williamsburg in the 1770s. Through research, she found out that girls didn’t get to go to school. They learned at home with a tutor. When she wrote the Samantha series, she would read the drafts to her husband. Because she wanted Samantha to go live in New York City with Uncle Garth, she decided to kill off Grand Mary. When her husband read the draft, he thought this was horrible and cold-hearted. So she revised and had Grand Mary remarry and take a sailing trip, requiring Samantha to go live in New York City. Now, both her husband and her were happy! When Ms. Valeria Tripp was 9 years old, her friends and her dressed up in Hawaiian outfits and mean Stevie Brown sprayed them with a hose, getting their handmade costume all wet and spilling their Halloween candy on the ground. Boy was she mad. 24 years later, she used that story from HER life and made it Molly’s story. She told the crowd today to PAY ATTENTION to all the stories occurring in your life. With your imagination and memory of stories from your life, YOU can write your own stories!!! She shared that she did not start out as a great writer. She showed us writing she did in first grade and the spelling was horrible. She asked if, when playing soccer, would we quit because she sweated, were out of breathe, and got dirty?? Of course not! The same must be remembered with writing. At first, we may struggle. But we can’t let that stop us. We have stories to tell. She suggested that we be CURIOUS…talk to the oldest relative; talk to the neighbor from another country. Then, with their stories and our own imagination, a new story can be written!! During the question/answer period, a boy asked what to do when you can’t get your good idea written down on paper. She suggested orally practicing what you what to write. Say it into a tape recorder, even. Then, after the oral practice, it will be easier to be written down.